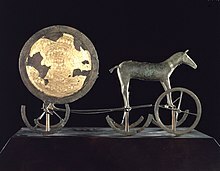 Proto-Indo-European religion has a solar chariot, the sun as traversing the sky in a chariot. In Germanic mythology this is Sol, in Vedic Surya, and in Greek Helios (occasionally referred to as Titan) and (sometimes) as Apollo. In Proto-indo-European mythology the sun appears to be a multilayered figure, manifested as a goddess but also perceived as the eye of the sky father Dyeus. The Tiv people consider the Sun to be the son of the supreme being Awondo and the Moon Awondo's daughter. The Barotse tribe believes that the Sun is inhabited by the sky god Nyambi and the Moon is his wife. Some Sara people also worship the sun. Even where the sun god is equated with the supreme being, in some African mythologies he or she does not have any special functions or privileges as compared to other deities. The ancient Egyptian god of creation, Amun is also believed to reside inside the sun. So is the Akan creator deity, Nyame and the Dogon deity of creation, Nommo. Also in Egypt, there was a religion that worshipped the sun directly, and was among the first monotheistic religions: Atenism. From at least the 4th Dynasty of ancient Egypt, the sun was worshipped as the deity Re (pronounced probably as Riya, meaning simply 'the sun'), and portrayed as a falcon headed god surmounted by the solar disk, and surrounded by a serpent. Re supposedly gave warmth to the living body, symbolised as an ankh: a "T" shaped amulet with a looped upper half. The ankh, it was believed, was surrendered with death, but could be preserved in the corpse with appropriate mummification and funerary rites. The supremacy of Re in the Egyptian pantheon was at its highest with the 5th Dynasty, when open air solar temples became common. In the Middle Kingdom of Egypt, Ra lost some of his preeminence to Osiris, lord of the West, and judge of the dead. In the New Empire period, the sun became identified with the dung beetle, whose spherical ball of dung was identified with the sun. In the form of the sun disc Aten, the sun had a brief resurgence during the Amarna Period when it again became the preeminent, if not only, divinity for the Pharaoh Akhenaton. In Aztec mythology, Tonatiuh (Nahuatl languages: Ollin Tonatiuh, "Movement of the Sun") was the sun god. The Aztec people considered him the leader of Tollan (heaven). He was also known as the fifth sun, because the Aztecs believed that he was the sun that took over when the fourth sun was expelled from the sky. According to their cosmology, each sun was a god with its own cosmic era. According to the Aztecs, they were still in Tonatiuh's era. According to the Aztec creation myth, the god demanded human sacrifice as tribute and without it would refuse to move through the sky. The Aztecs were fascinated by the sun and carefully observed it, and had a solar calendar similar to that of the Maya. Many of today's remaining Aztec monuments have structures aligned with the sun. Sun worship was apparently practiced in Pre-Islamic Arabia, abolished only under Muhammad. The Arabian solar deity appears to have been a goddess, Shams/Shamsun, most likely related to the Canaanite Shapash and broader middle-eastern Shamash. She was the patron goddess of Himyar, and possibly exalted by the Sabaeans and early Bedouin. The devas Surya and Candra are also recognized as deities that embody the sun and moon, respectively. Those who practice Dievturība, beliefs of traditional Latvian culture, celebrate the Sun goddess, Saule, known in traditional Lithuanian beliefs as Saulė. Saule/Saulė is among the most important deities in Baltic mythology and traditions. The sun in Insular Celtic culture is assumed to have been feminine, and several goddesses have been proposed as possibly solar in character. In Continental Celtic culture, the sun gods, like Belenos, Grannos, and Lug, were masculine. Even the Gayatri mantra, which is regarded as one of the most sacred of the Vedic hymns is dedicated to Savitr, one of the principal Ādityas. The Adityas are a group of solar deities, from the Brahmana period numbering twelve. The ritual of Surya Namaskaar, performed by Hindus, is an elaborate set of hand gestures and body movements, designed to greet and revere the Sun. The halo of Jesus, seen in many paintings, has similarities to a parhelion. According to one hypothesis about Christmas, it was set to 25 December because it was the date of the festival of Sol Invictus. This idea became popular especially in the 18th and 19th centuries. Another speculation connects the biblical elements of Christ's life to those of a sun god. The Christian gospels report that Jesus had 12 followers, which is claimed to be akin to the twelve zodiac constellations. When the sun was in the house of Scorpio, Judas plotted with the chief priests and elders to arrest Jesus by kissing him. As the sun exited Libra, it enters into the waiting arms of Scorpio to be kissed by Scorpio's bite. Many of the world's sacrificed godmen have their traditional birthday on December 25. During this time, people believed that the "sun god" had "died" for three days and was "born again" on December 25. After December 25, the Sun supposedly moves 1 degree north, foreshadowing longer days. The three days following December 21 remain the darkest days of the year where Jesus (the sun) dies and remains unseen for three days. At the beginning of the first century, the sun on the vernal equinox passed from Aries to Pisces (1 A.D. to 2150 A.D). That harmonizes with the mentioned lamb and fish in the gospels. The man carrying a pitcher of water (Luke 22:10) is Aquarius, the water bearer, who is always seen as a man pouring out a pitcher of water. He represents the age after Pisces, and when the Sun leaves the Age of Pisces (Jesus), it will go into the House of Aquarius. By "the sun of righteousness" in Malachi 4:2 "the fathers, from Justin downward, and nearly all the earlier commentators understand Christ, who is supposed to be described as the rising sun". The New Testament itself contains a hymn fragment: "Awake, O sleeper, and arise from the dead, and Christ will shine on you." Clement of Alexandria wrote of "the Sun of the Resurrection, he who was born before the dawn, whose beams give light". The Philocalian calendar of AD 354 gives a festival of "Natalis Invicti" on 25 December. There is limited evidence that this festival was celebrated before the mid-4th century. The charioteer in the mosaic of Mausoleum M has been interpreted by some as Christ. Clement of Alexandria had spoken of Christ driving his chariot across the sky. This interpretation is doubted by others: "Only the cross-shaped nimbus makes the Christian significance apparent". and the figure is seen by some simply as a representation of the sun with no explicit religious reference whatever, pagan or Christian. In the judgement of the Church of England Liturgical Commission, this view has been seriously challenged by a view based on an old tradition, according to which the date of Christmas was fixed at nine months after 25 March, the date of the vernal equinox, on which the Annunciation was celebrated. 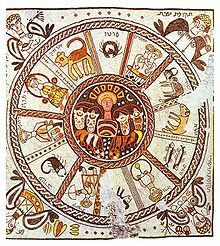 The Jewish calendar date of 14 Nisan was believed to be that of creation, as well as of the Exodus and so of Passover, and Christians held that the new creation, both the death of Jesus and the beginning of his human life, occurred on the same date, which some put at 25 March in the Julian calendar. It was a traditional Jewish belief that great men lived a whole number of years, without fractions, so that Jesus was considered to have been conceived on 25 March, as he died on 25 March, which was calculated to have coincided with 14 Nisan. Sextus Julius Africanus (c.160 – c.240) gave 25 March as the day of creation and of the conception of Jesus. The tractate De solstitia et aequinoctia conceptionis et nativitatis Domini nostri Iesu Christi et Iohannis Baptistae falsely attributed to John Chrysostom also argued that Jesus was conceived and crucified on the same day of the year and calculated this as 25 March. A passage of the Commentary on the prophet Daniel by Hippolytus of Rome, written in about 204, has also been appealed to. Among those who have put forward this view are Louis Duchesne, Thomas J. Talley, David J. Rothenberg, J. Neil Alexander, and Hugh Wybrew. The Oxford Companion to Christian Thought also remarks on the uncertainty about the order of precedence between the celebrations of the Birthday of the Unconquered Sun and the birthday of Jesus: "This 'calculations' hypothesis potentially establishes 25 December as a Christian festival before Aurelian's decree, which, when promulgated, might have provided for the Christian feast both opportunity and challenge." Susan K. Roll calls "most extreme" the unproven hypothesis that "would call Christmas point-blank a 'christianization' of Natalis Solis Invicti, a direct conscious appropriation of the pre-Christian feast, arbitrarily placed on the same calendar date, assimilating and adapting some of its cosmic symbolism and abruptly usurping any lingering habitual loyalty that newly-converted Christians might feel to the feasts of the state gods". Both the sun and Christ were said to be born anew on December 25. But while the solar associations with the birth of Christ created powerful metaphors, the surviving evidence does not support such a direct association with the Roman solar festivals. The earliest documentary evidence for the feast of Christmas makes no mention of the coincidence with the winter solstice. Thomas Talley has shown that, although the Emperor Aurelian's dedication of a temple to the sun god in the Campus Martius (C.E. 274) probably took place on the 'Birthday of the Invincible Sun' on December 25, the cult of the sun in pagan Rome ironically did not celebrate the winter solstice nor any of the other quarter-tense days, as one might expect. The origins of Christmas, then, may not be expressly rooted in the Roman festival. The same point is made by Hijmans: "It is cosmic symbolism...which inspired the Church leadership in Rome to elect the southern solstice, December 25, as the birthday of Christ ... While they were aware that pagans called this day the 'birthday' of Sol Invictus, this did not concern them and it did not play any role in their choice of date for Christmas." He also states that, "while the winter solstice on or around December 25 was well established in the Roman imperial calendar, there is no evidence that a religious celebration of Sol on that day antedated the celebration of Christmas". A study of Augustine of Hippo remarks that his exhortation in a Christmas sermon, "Let us celebrate this day as a feast not for the sake of this sun, which is beheld by believers as much as by ourselves, but for the sake of him who created the sun", shows that he was aware of the coincidence of the celebration of Christmas and the Birthday of the Unconquered Sun, although this pagan festival was celebrated at only a few places and was originally a peculiarity of the Roman city calendar. It adds: "He also believes, however, that there is a reliable tradition which gives 25 December as the actual date of the birth of our Lord." 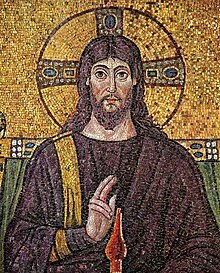 The comparison of Christ with the astronomical Sun is common in ancient Christian writings. In the 5th century, Pope Leo I (the Great) spoke in several sermons on the Feast of the Nativity of how the celebration of Christ's birth coincided with increase of the sun's position in the sky. An example is: "But this Nativity which is to be adored in heaven and on earth is suggested to us by no day more than this when, with the early light still shedding its rays on nature, there is borne in upon our senses the brightness of this wondrous mystery. Christians adopted the image of the Sun (Helios or Sol Invictus) to represent Christ. 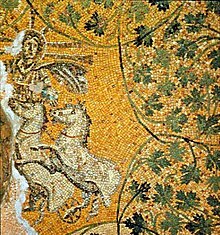 In this portrayal he is a beardless figure with a flowing cloak in a chariot drawn by four white horses, as in the mosaic in Mausoleum M discovered under Saint Peter's Basilica and in an early-4th-century catacomb fresco. Clement of Alexandria had spoken of Christ driving his chariot in this way across the sky. A "solar barge"—also known as a "solar bark", "solar barque", "solar boat", or "sun boat"—is a mythological representation of the sun riding in a boat. The most famous of these is the Atet, the barge of the Egyptian sun god Ra. The "Khufu ship", a 43.6-meter-long vessel that was sealed into a pit in the Giza pyramid complex at the foot of the Great Pyramid of Giza around 2500 BC, is a full-size surviving example which may have fulfilled the symbolic function of a solar barque. This boat was rediscovered in May 1954 when archeologist Kamal el-Mallakh and inspector Zaki Nur found two ditches sealed off by about 40 blocks weighing 17 to 20 tonnes each. This boat was disassembled into 1,224 pieces and took over 10 years to reassemble. A nearby museum was built to house this boat. so that they can't turn back in the morning or lie down at night. Left to themselves the old won't die; the young won't cry." In Germanic mythology the Sun is female and the Moon is male. The corresponding Old English name is Siȝel [ˈsɪjel], continuing Proto-Germanic *Sôwilô or *Saewelô. The Old High German Sun goddess is Sunna. In the Norse traditions, Sól rode through the sky on her chariot every day, pulled by two horses named Arvak and Alsvid. Sól also was called Sunna and Frau Sunne. Other cultures that have sun goddesses include the Lithuanians (Saulė) and Latvians (Saule), the Finns (Päivätär, Beiwe) and the related Hungarians. Sun goddesses are found around the world in Australia (Bila, Walo), India (Bisal-Mariamna, Bomong, Kn Sgni), among the Hittites (Wurusemu), and Egyptians (Sekhmet), in the Canary Islands (Chaxiraxi)/(Magek), in Native America, among the Cherokee (Unelanuhi), Natchez (Wal Sil), Inuit (Malina), and Miwok (Hekoolas), and in Asia among the Japanese (Amaterasu). ^ In most romance languages the word for "sun" is masculine (e.g. le soleil in French, el sol in Spanish, Il Sole in Italian). In most Germanic languages it is feminine (e.g. Die Sonne in German). In Proto-Indo-European, its gender was inanimate. ^ Ancient Civilizations- Egypt- Land and lives of Pharaohs revealed. Global Book Publishing. p. 79. ISBN 1740480562. ^ Dexter, Miriam Robbins (Fall–Winter 1984). "Proto-Indo-European Sun Maidens and Gods of the Moon". Mankind Quarterly. 25 (1 & 2): 137–144. ^ Teeter, Emily (2011). Religion and Ritual in Ancient Egypt. New York: Cambridge University Press. ISBN 9780521848558. ^ Frankfort, Henri (2011). Ancient Egyptian Religion: an Interpretation. Dover Publications. ISBN 0486411389. ^ Biblioteca Porrúa. Imprenta del Museo Nacional de Arqueología, Historia y Etnología, ed. (1905). Diccionario de Mitología Nahua (in Spanish). México. pp. 648, 649, 650. ISBN 978-9684327955. ^ Julian Baldick (1998). Black God. Syracuse University Press. p. 20. ISBN 0815605226. ^ a b c d Patricia Monaghan, The Encyclopedia of Celtic Mythology and Folklore, page 433. ^ Koch, John T., Celtic Culture: Aberdeen breviary-celticism, page 1636. ^ X., Delamarre, (2003). Dictionnaire de la langue gauloise : une approche linguistique du vieux-celtique continental (2e éd. rev. et augm ed.). Paris: Errance. pp. 72 & 183 & 211. ISBN 9782877723695. OCLC 354152038. ^ Media, Adams (2016-12-02). The Book of Celtic Myths: From the Mystic Might of the Celtic Warriors to the Magic of the Fey Folk, the Storied History and Folklore of Ireland, Scotland, Brittany, and Wales. "F+W Media, Inc.". p. 45. ISBN 9781507200872. ^ MacCulloch, J. A. (2005-08-01). The Celtic and Scandinavian Religions. Chicago Review Press. p. 31. ISBN 9781613732298. ^ a b MacKillop (1998) pp. 10, 70, 92. ^ Nicole Jufer & Thierry Luginbühl (2001). 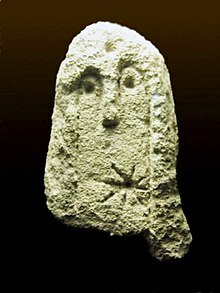 Les dieux gaulois : répertoire des noms de divinités celtiques connus par l'épigraphie, les textes antiques et la toponymie. Editions Errance, Paris. pp. 15, 64. ^ Sir Edward Burnett Tylor, Researches Into the Development of Mythology, Philosophy, Religion, Art, and Custom, Volume 2, p. 270; John Murray, London, 1871; revised edition 1889. ^ Philip Schaff, History of the Christian Church, Volume 3, 1885, T and T Clark, Edinburgh, page 396; see also Volume 4 in the 3rd edition, 1910 (Charles Scribner's Sons, NY). ^ Anderson, Michael Alan (2008). Symbols of Saints. ProQuest. p. 45. ISBN 978-0-54956551-2. ^ "The Day God Took Flesh". Melkite Eparchy of Newton of the Melkite Greek Catholic Church. 25 March 2012. ^ Martindale, Cyril (1913). "Christmas" . In Herbermann, Charles. Catholic Encyclopedia. New York: Robert Appleton Company. ^ Tester, Jim (1999). A History of Western Astrology. Suffolk, UK: Boydell Press. ^ McKnight, Scot (2001). "Jesus and the Twelve" (PDF). Bulletin for Biblical Research. 11 (2): 203–231. Retrieved 11 September 2017. ^ Acharya S/D.M. Murdock (2011). "Origins of Christianity" (PDF). Stellar House Publishing. Retrieved 11 September 2017. ^ Nicholas Campion, The Book of World Horoscopes, The Wessex Astrologer, 1999, p. 489 clearly refers to both conventions adopted by many astrologers basing the Ages on either the zodiacal constellations or the sidereal signs. ^ Declercq, Georges (2000). Anno Domini: The Origins of the Christian Era. Brepols Essays in European Culture. Belgium: Turnhout. ISBN 9782503510507. ^ Kuhn, Alvin Boyd (1996). "The Great Myth of the SUN-GODS". Mountain Man Graphics, Australia. Retrieved 11 September 2017. Note: This is a reprint; Kuhn died in 1963. ^ "Gospel Zodiac". The Unspoken Bible. Retrieved 11 September 2017. ^ Elie, Benedict. "Aquarius Pisces Age". Astro Software. Retrieved 11 September 2017. ^ "Origins Zodiac Bible Code". US Bible. Retrieved 23 February 2018. ^ a b "Aquarius". Retrieved 23 February 2018. ^ Wallraff 2001: 174–177. Hoey (1939: 480) writes: "An inscription of unique interest from the reign of Licinius embodies the official prescription for the annual celebration by his army of a festival of Sol Invictus on December 19". The inscription (Dessau, Inscriptiones Latinae Selectae 8940) actually prescribes an annual offering to Sol on November 18 (die XIV Kal(endis) Decemb(ribus), i.e. on the fourteenth day before the Kalends of December). ^ Text at  Parts 6 and 12 respectively. ^ Webb, Matilda (2001). The Churches and Catacombs of Early Christian Rome. Sussex Academic Press. p. 18. ISBN 978-1-90221058-2. ^ Hijmans 2009, p. 567-578. ^ "» Feast of the Annunciation". melkite.org. ^ a b Oxford Dictionary of the Christian Church (Oxford University Press 2005 ISBN 978-0-19-280290-3), article "Christmas"
^ See discussion in the Talmud (Avraham Yaakov Finkel, Ein Yaakov (Jason Aronson 1999 ISBN 978-1-46162824-8), pp. 240–241), and Aryeh Kaplan's chapter, "The Shofar of Mercy", on the apparent contradiction between that tradition and the Jewish celebration of creation on 1 Tishrei. ^ "Hippolytus and December 25th as the date of Jesus' birth" (PDF). ^ a b Weitzmann, Kurt (1979). Age of Spirituality. Metropolitan Museum of Art. p. 522. ISBN 978-0-87099179-0. ^ "CHURCH FATHERS: Sermon 26 (Leo the Great)". www.newadvent.org. ^ Powell, A.E. The Solar System London:1930 The Theosophical Publishing House (A Complete Outline of the Theosophical Scheme of Evolution). Lucifer, represented by the sun, the light. ^ William Ridgeway (1915). "Solar Myths, Tree Spirits, and Totems, The Dramas and Dramatic Dances of Non-European Races". Cambridge University Press. pp. 11–19. Retrieved March 19, 2015. ^ "Helios". Theoi.com. Retrieved 22 September 2010. ^ "Helios & Phaethon". Thanasis.com. Retrieved 18 September 2010. ^ a b Bien, Gloria (2012). Baudelaire in China a Study in Literary Reception. Lanham: University of Delaware. p. 20. ISBN 9781611493900.